We wanted to create a tour that spoke to our intrepid guests. The ones whose bucket lists are a bit more…lofty. Jordan is that tour, and together we’ll venture through hidden cities, over endless dunes, in search of wonder, magic, and of course, unbelievable photographs. If you’re asking yourself, “What could be so amazing on a tour in the desert?” Good. We like to see our guests jaw drop. With our local Bedouin guides and translators, our caravan will wind its way through this beautiful country, starting in the capital city of Amman and visiting Jerash, the Dead Sea, Wadi Rum Desert and the lost city of Petra. We’ll venture to fruit and spice markets, sampling local delicacies, tour area mosques and travel camel-back across the Mars-like red desert to explore cities dating back before Julius Caesar ruled. Fedora and bullwhip optional. This is our most luxurious tour and our guests will be treated to incredibly luxurious accommodations at world-class hotels, spas, eco-resorts, and even a deluxe space dome in the middle of the Wadi Rum desert where so many Hollywood Mars-themed movies are filmed. Of course, you will capture all this beauty while traveling side-by-side with our professional photographers. With their hands-on guidance, vast experience and professional tips, you’ll capture the intricate details, vivid colors and ancient wonders of each place we visit. When we get to Petra, after the sun has gone down, we’ll wind our way down a narrow path, lit only by candlelight, and photograph its Treasury and local ceremonies. We’ll even get a moment with the Treasury, surrounded by nothing more than desert land and lit candles, before other tourists arrive and after they leave; an experience that is especially exclusive to our group. This is just one of the many magical moments we’ll experience together on this Discovery Photo Tour. We only allow twelve friends to join us, as we like to save this tour for small, intimate groups. Read below to find out all of the magical experiences we’ll share together, and after you reserve your spot, feel free to reach out to us if you need any help booking your flights. During our tour of Jordan, we’ll indulge in delicious Middle Eastern cuisine, experience a society guided by religion and faith and learn about the history that’s made Jordan the vibrant country it is today. We’ll make friends with Bedouin locals, engaging in familiar conversation as we sip on homemade cups of piping hot, sugary Jordanian tea. If you haven’t gone through the life-changing experience that is seeing Petra by candlelight, you will be able to check that off your bucket list after this trip.. We’re the only tour in the world that gets to stay after the Bedouin ceremony and photograph the shimmering stars over the Monastery by moonlight; a unique moment that inspiration seekers far and wide would beg to experience. We won’t lie: we’re pretty good at what we do, and our Jordan tour proves why. In a mystical part of the world most people never get the chance to see, we’ve taken all the guesswork out of when, and how, to capture the magic. 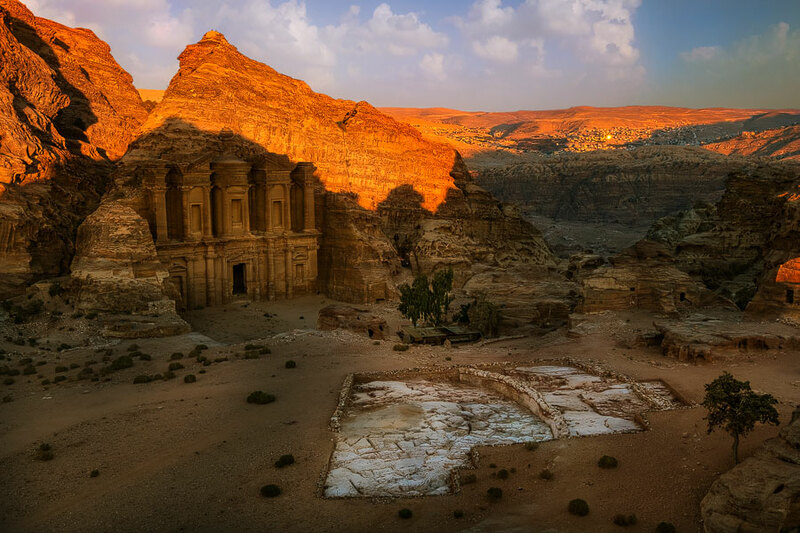 From the fiery red sands of the Mars-like Wadi Rum desert and the captivating lost city of Petra, to the sparkling Dead Sea, the serenity of the Dana Biosphere reserve and more, our Jordan tour delivers an unbelievable photography experience. To say our talented photographers make our tours so incredible would be an understatement. That’s why they are carefully chosen and paired on each of our tours. Making sure they compliment each other, fulfill the needs of our guests and provide you with an experience of a lifetime. And although our tour leaders are all world renowned masters of photography, to be considered for a tour leader position with Discovery requires so much more. When you’re traveling with us for 10 days across the desert, you can be sure that our photographers are an absolute joy to be with. Eager to teach, share and enjoy every breath taking moment with you, they have a passion for life that’s contagious and bring out the best in everyone. You’ll travel, explore and learn with them, you’ll share meals together, and they’ll show you how to capture amazing pictures. And at the end of the tour, you’ll have a lifelong friend; the newest addition to your holiday card list. Step off your plane in Amman, the capital of Jordan, and look around: you’re in the thriving Middle East. As your driver takes you to your hotel, soak up the city’s dichotomy – from lively, cultured Western Amman to its conservative, more laid-back Eastern counterpart, all amidst rolling hills, Roman ruins, mosques and local souk markets everywhere you turn. Unwind in our hotel for a bit; then it’s time for our group welcome dinner. Let’s celebrate life, friendship and the start of a new journey together with local Arabic and Jordanian favorites, like baba ganoush, tabouli , falafels, tahini hummus, fresh olive oils and more. On our first full day in Jordan, we’ll wake up to the sound of morning prayers that are sung by the Imams from the local mosques before heading out to photograph the Roman Amphitheater and local fruit and spice market. We’ll follow this with a local Jordanian lunch, where we’ll get to taste Knafeh, an Arabic pastry made with Palestinian cheese and doused in savory syrup. We’ll spend our afternoon taking photos of Duke’s Diwan, the oldest residence in Amman, and before nightfall, we’ll use our cameras to capture the golden sun setting over the shimmering blue rooftops of King Abdullah II’s mosque. Be prepared for a special surprise for this incredible sunset shoot! We’ll start and end our day in the capital city of Amman (formerly Philadelphia), where we’ll take pictures of the city’s most iconic structures and photograph the Citadel at sunrise and we have it all to ourselves for nearly two hours before opening to the public. This is thanks to our connections with the Minister of Tourism and Antiquities, who is eager to give our group a better understanding of Jordan’s culture and the nation’s friendship with the Western world. During the day, we’ll have one of our most authentic culinary experiences. Thanks to a family owned restaurant, we’ll have a special lunch in the ancient capital and indulge in Mansaf, the national dish of Jordan, a traditional plate of spiced lamb cooked in yogurt and served over a bed of rice. On this day, we’ll experience life in Jordan as it really is: relaxed, friendly, and a direct result of its beautiful natural surroundings. We end the day with equal privilege in Jerash, where we’ll see the Greco-Roman ruins of the Ancient city of Gerasa and stay after closing hours to capture the blue hour over some of the best preserved Greco Roman ruins in the world. Have you ever been so buoyant in water, that you almost felt like you could sit up in it? Today, you will. There’s no place on Earth quite like the Dead Sea, and we’ll take our time to enjoy its Jordanian coast. After bathing ourselves in the soft mud that surrounds its crystallized shores, we’ll step into these mystic waters and float around its emerald edges . That night, we’ll rest at our sumptuous Hotel and Spa, right on the shores of the Dead Sea, and let the magic of the day sink in. Today, we’ll get lost in the Wadi Rum desert, roaming through the Mars-like terrain as we snap exclusive shots of flat water, the Dead Sea and endless views of sweeping red sand basins. To get to the heart of it, we’ll hop on a rugged jeep tour led by Bedouin locals, the indigenous people of Jordan, learning about the region’s customs, cultures and history as we wind our way off Jordan’s beaten path. Channeling Lawrence of Arabia, we’ll go even deeper on camel-back. It’s then that we’ll take enchanting photos of the glowing sunset over Wadi Rum – when its red sands are bathed in the sun’s golden rays – we’ll return to that night’s abode: rustic, luxurious, Bedouin tents, right in the desert, where our new friends will cook authentic Jordanian “Zarb” in an oven beneath the sand, all while regaling us with tales of Bedouin life. Wake up with the sun and get ready for a life-changing experience you’ll never forget. After an optional hot air balloon ride over the mystical desert, we’ll slowly make our way to the historic town of Petra. As the hidden city appears, you will the see the red, white and pink-hued faces of the sandstone cliffs that the city is carved into. Here, it’s easy to see why, aside from its history, Petra is both a UNESCO World Heritage Site and one of the new Seven Wonders of the World. As we explore its deepest corners, follow the local Bedouins into their dwelling caves, let them make you a cup of tea, and picture yourself wandering through Petra nearly 2,000 years ago. It was then that these samples of Jordanian grandeur were first built. When the sun goes down, the real magic begins. We’ll experience and photograph Petra by Night, an evening ceremony right in front of the Treasury, where a sea of candles lights up the otherwise moonlit canyons, and take it all in as we sit on mats on the ground, listen to traditional Bedouin music played on their special instruments, and sip that sweet tea they love to share. After everyone has left, we’ll have the unique opportunity to stay an extra 30 minutes to photograph the candlelit Treasury without all the spectators obstructing your view. Use this day to sleep in – after five days of roaming through the Jordanian desert, your body will thank you for it. Today, we’ll leave the inspiring city of Petra and journey to our next heavenly destination, which just happens to be a world-class ecolodge. We’ll traverse the rough gravel “roads” as local Bedouins drive us through Dana’s rugged terrain, eventually winding our way to our temporary home, the idyllic Ecolodge: a candle-lit escape where authentic Bedouin hospitality beckons, natural beauty reigns and electricity ceases to exist. Sitting deep in the heart of the rugged Dana Biosphere Reserve, this hotel is completely green and locally sourced. Together, we’ll enjoy a traditional Bedouin tea ceremony, complete with sweet, minty black tea, and follow our new Bedouin friends on a leisurely sunset hike, taking photos of the sun setting over Ma’in. For the evening meal, we’ll enjoy a succulent organic vegetarian dinner, and reflect on our opportunity to disconnect from the outside world and connect with one another. Be ready to let your mind, body and soul indulge in the luxury of a decadent spa resort, one with relaxing vibes, delicious food, luxurious rooms and a thermal pool with an incredible hot waterfall. There are no planned shots this day; purely time to relax. While there, we’ll enjoy each other’s company and authentic Middle Eastern cuisine – like spiced lamb steeped in oil and herbs, meats cooked in an underground oven and local Jordanian wines. A perfect day to prepare to return to the real world! We’ll say goodbye to our new friends (one another! ), and from there, take a transfer directly to the airport. If you want to extend your journey on this day, you’ll have all the freedom in the world to do so. Here, you’re ideally situated in a central area, just perfect for discovering the deepest corners of mystical Jordan, as you wish. Bring a healthy appetite to Jordan because you’re going to need it. The Jordanian people are the most generous folks we have met on all of our journeys and very proud of the local fare, rightfully so. From the vast array of food at the breakfast buffet in Amman, to the quaint local restaurants in Petra where you’ll have the tastiest Arabic food and the special meal of Mansaff (Jordan’s national dish) that is presented to our cherished guests on a tour of the ancient capital of Al-Salt. Don’t forget the scrumptious all vegetarian delicacies served at our eco-resort, you’ll be going back for seconds, we promise. Arabic, Lebanese, Jordanian, western, and fusion foods are all on the menu. Hungry yet? In Jordan, you’ll live like kings and queens as we treat you to the finest hotels, spas, and eco-resorts in the country. This is pure five-star luxury accommodations, so we’re hoping that you like being pampered and all the finer things in life. We also have the coolest and newest hi-tech space domes for you to enjoy as your temporary home in the middle of the Mars-like Wadi Rum desert. These awesome structures have perfectly clear domed roofs and you’ll be counting shooting stars as you drift off to sleep gazing at the heavens. Our eco-resort is rated as one of the best in the world and you’ll be welcomed with open arms by your Bedouin hosts who will also guide you for your sunset walk and coffee ceremony in a nearby tented nomadic camp. We love our spa and resort so much that we stay there twice on this journey. The experience is so relaxing that our team usually stays an extra day or two after the end of the tour just to unwind at one of the finest spas in all of the middle east. Petra Monastery Under Stars - Only tour in the world to offer this! Unprecedented VIP access to Petra and other UNESCO World Heritage Sites - email us for details! There is an $895 single supplement fee. Choose your room type below and add to cart to complete your pre-registration and reserve your spot to join us on this once-in-a-lifetime experience. I have taken three photography tours with Ken Kaminesky, and each one has been special and awesome in its own way. On my first tour to Jordan, I had no idea what to expect, but had one of the best experiences of my life. On my second trip, I went to my #1 bucket list destination, Italy, and it went beyond my expectations – even with some crazy weather. On my third trip to Cambodia, I was profoundly impacted by what I saw and the people we interacted with. Each trip has been unique, and each was an amazing experience. I have come home each time with a wonderful set of pictures, but even better – a whole new group of friends. I can’t wait to go on my next trip! I had joined Ken on a tour to Jordan. It was a fantastic trip in that he had scoped out all the sites and provided great guidance to make great pictures. Having been on other tours Ken keeps the pace enjoyable as it still is a vacation, yet full to make sure you can get those great shots. Highly recommended. Fun, educational, inspiring, adventurous and life-changing… just a few of the words I’d use to describe how incredible my experience of joining a photo tour in Jordan with Ken and Patrick was. Not only did I get to tick off one of my ‘bucket list’ travel destinations, but I did so in the company and under the guidance of two very kind and talented photographers. Meticulous planning ensured that we were met with one jaw-dropping location after another as well as being there at the perfect time of day and with ample time to photograph the scenes. As a novice photographer I was nervous about joining a photography tour but I needn’t have been. Patrick’s endless patience and ability to explain things in simple terms ensured I came away with a suite of new techniques as well as stunning photographs. Aside from this, I also made friends for life – who knew that traveling with a group of strangers from all over the world could be so much fun?! I’ll never forget sitting under a blanket of stars at the Monastery in Petra, truly a once-in-a-lifetime experience. The tour ignited my passion for photography and has changed my life in ways I couldn’t have imagined… I can’t wait for the next destination with you!